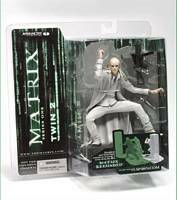 Description Of Item: Matrix - Twin 2. The Matrix Reloaded and The Matrix Revolutions -- are coming to theatres in 2003. The filmmakers have teamed with McFarlane Toys to create revolutionary collectible figures. Series 1 contains five individual figures and a deluxe boxed edition.